"…their holiday concert last night sped down the highway of music like a solid gold Rolls Royce." 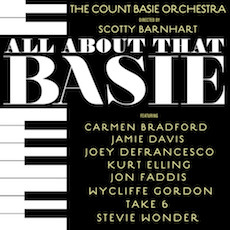 IT’S CHRISTMAS, viagra CATS Since its inception in 1935, the Count Basie Orchestra has not just outlived the era in which it was spawned, but has remained a well-oiled machine of Big Band jazz, even after Basie’s death in 1984. After a bit of a sputter with sound issues and energy, their holiday concert last night sped down the highway of music like a solid gold Rolls Royce. A Swingin’ Christmas was inadvertently a tribute to the great Neil Hefti, who charted some of the band’s greatest tunes. It took a little while for the orchestra and its new conductor Scotty Barnhart to pep it up and become accustomed to Disney Hall’s tricky acoustics, but they really came alive by selection number 5 of a 22-song set: Hefti’s “Cute.” This 1950s Basie standard gave sweet show spots to alto saxophonist Cleave Guyton and his jazzy flute, and Clayton Cameron on drums (Jerry Lewis famously danced to this song in 1960’s Cinderfella). Kris Johnson showed off his extraordinarily strong but dreamy trumpet in Hefti’s slow-tempo signature Basie tuner, “Lil Darlin’,” and the entire band blew the house down with Hefti’s rocking “Whirly Bird,” aided by Doug Lawrence’s red-hot tenor sax and Cameron’s scorching on the skins (Hefti’s son, Paul, was in the house). In fact, Cameron captivated throughout the night (his mom was in the house! ), showing off his intricate brushwork on a single snare drum during Barnhart’s brand new “Little Drummer Boy.” Barnhart, who is also a professor of jazz trumpet at Florida State University, had a field day with his brassy-gold trumpet and plunger, offering a mean Dixieland sound with horse whinnies, whimsical blasts and high-pitched squeaks. Other hot solos: The clean blasts of Bruce Harris’s trumpet on Frank Wess’s “Half Moon Street” and Endre Rice’s bluesy muted trumpet on Thad Jones’ “From One to Another.” In fact, the whole trumpet section had a chance to do some clowning around. It’s a shame that the trombones weren’t given more space to show off with improvisational soloing. The amplification caused a hollow, echoed sound which seemed to get better later on. I wonder what the gang would have sounded like with just the soloists miked. The acoustics are so great that, just before the concert began, one of the players sneezed and he got applause from the balcony! Still, a supremely delicious rendition of “Have Yourself a Merry Little Christmas”—with lovely vocals from Morrell and more ridiculously sizzling and sweltering from Lawrence’s sax—cemented a perfectly swingin’ yule.